Someone asked me this week why I chose Howick as a place to live. Mainly because we had friends in the area, I explained, and being from Wellington, we needed to be close to the coast. 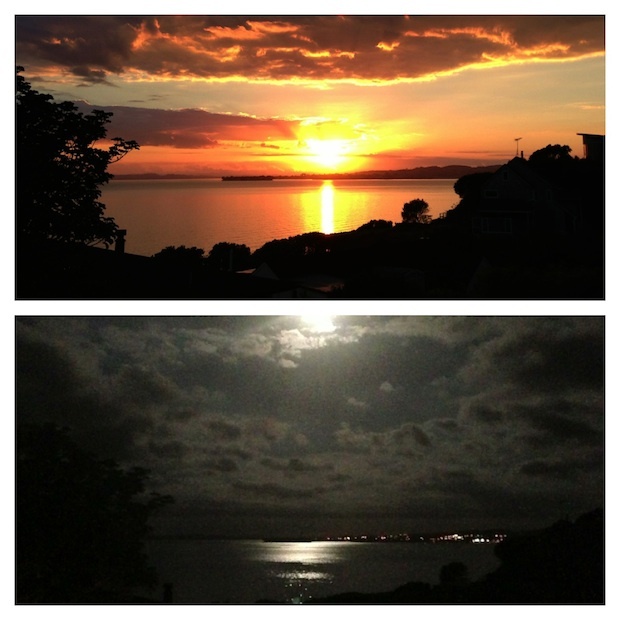 This is the view from my kitchen yesterday morning and last night with the full moon. I find it helps me breathe. PS: I remember celebrating a dawn out that same window with Time Lapse. I have a very similar photo of the moon that i took this time last year while dropping my daughters off at a party on a cliff top street in Howick. We are very blessed to live in such a wonderful little suburb with the only drawback being the traffic to get to the city every day. Some of us are not QUITE as blessed as you are with that view though! You moved from Wellington to Auckland to breathe? Wellington the freshest air in New Zealand fully replenished every 15 minutes. Heh, that’s true about the air circulation, and San Francisco is similar. I have a saying: I didn’t leave Wellington because of the climate. but its climate is the reason I won’t move back. Wellington is a beautiful and wonderfully compact city. it’s easy to walk from Parliament to Manners Street in a lunch hour. There’s nothing in Auckland that matches the pumping of Courtenay Place with its nightclubs, restaurants, pubs. All that said, I am loving Auckland. It’s easier to live in this climate — it’s not as ‘bracing’ as the capital. Probably a factor is that my work/business life doesn’t require my regular presence in the CBD nor traveling in peak times. There are many who cant.